The 11th International Student Company Festival in Riga this year gathered 500 students and teachers from 14 countries. On the 10th of April we found out who this year had been nominated for the ISCF awards and crowned the winners. Haven't yet seen who they were? Registration with the Early-Bird fee is open only until the 25th of January, don't miss your chance to use it! Merry holidays and a happy New Year! Junior Achievement Latvia wishes to all sincere greetings in the upcoming holidays! 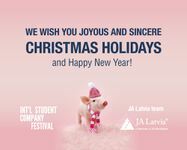 JA Latvia is thrilled to announce the dates for the International Student Company Festival 2019 - event that is part of the JA Marketplace events. International Student Company festival was attended by 102 companies from 13 countries. The best companies were selected in eight categories. Thank you all - participants, partners, jury, volunteers! The 10th #ISCFLatvia is concluded!